All gardeners are people: therefore, all gardeners make mistakes. Here's a list of the nine most common ones and a tenth that is more of a gardening felony than a boo-boo. Get to the root of the problem. Water deeply. A simple sprinkling will not do. Instead, thoroughly moisten the entire root system. Plants that are watered shallowly will become shallow rooted and will be unable to withstand drought. Newly planted annuals, perennials, trees, and shrubs are particularly vulnerable. The root ball they came with is all they have to sustain them until they establish their roots into the surrounding soil. If a plant’s root ball dries out, it will die. Even drought tolerant plants require careful watering until established and are not drought tolerant until then. Too much water can be as bad as too little. Roots require air space in the soil to absorb water and nutrients. Ideally the space between soil particles should be half filled with air and half with water. If all the space is filled with water, plants can die of hunger and thirst, showing the same symptoms as drought. This was once primarily a problem with houseplants, but automatic irrigation systems and the frequency with which they are used has led to an increase of drowned plants, especially trees and shrubs. To avoid root rot, put out a rain gauge and only add enough water to established trees and shrubs to bring the weekly total to 1 inch. Remember, that most established trees and shrubs should be watered at most once a week and that light sprinklings make for shallow-rooted plants. Lawns can get by on this same schedule. Click here for more information on overwatering. 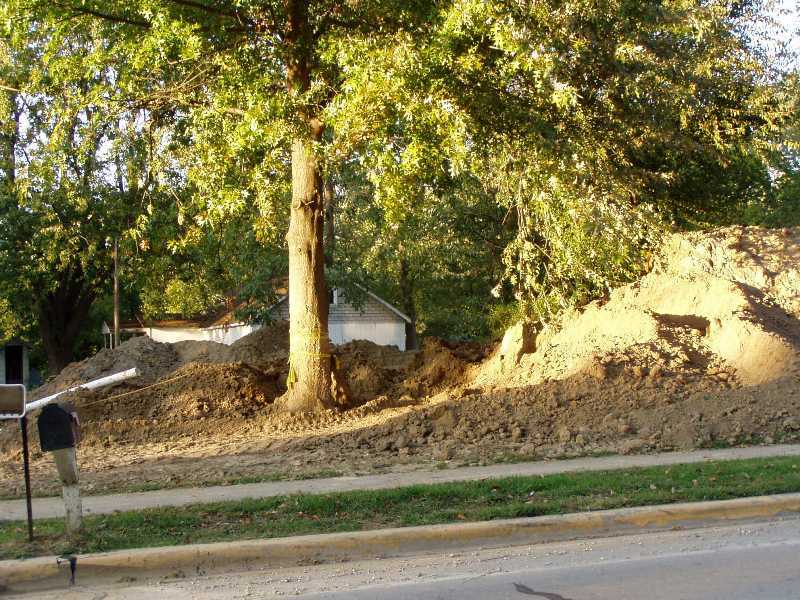 Planting trees so deep that their trunks come straight out of the soil like telephone poles often results in girdling roots and usually means a gradual decline and eventual death of a tree. 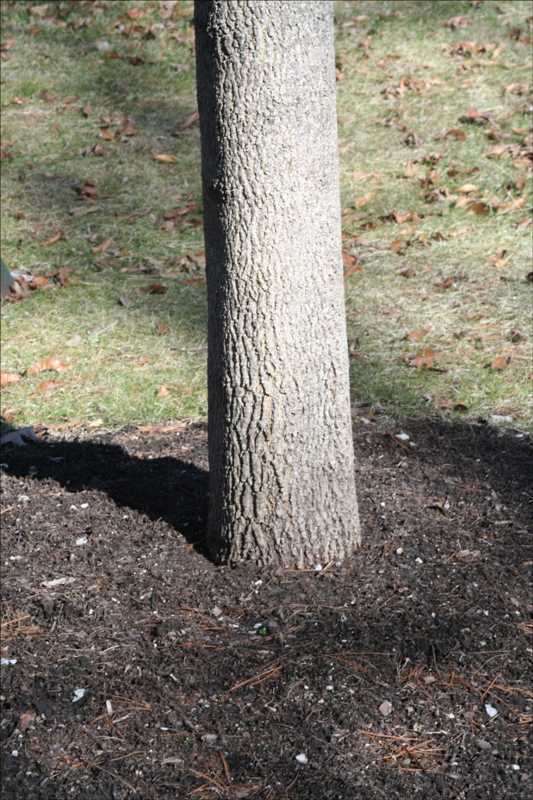 When planting a tree, particularly in heavy soils, the crown of the tree (the point at which the tree trunk emerges from the soil) should be positioned several inches above grade, and the soil brought up level with the top of the root ball. Never dig the planting hole deeper than the height of the root ball, because even if filled in, the soil beneath the root ball will settle over time and cause the tree to sink too low in the soil. Trunks can also look like telephone poles when soil has been piled onto the root zone during construction work or renovations. This can smother the roots and kill a tree over time. Paving over the root zone is also damaging, cutting off air, water and nutrients vital to tree health. Making trees look like telephones is bad, but treating them like telephone poles is just as bad. Unlike telephone poles, which are of course just dead wood, trees are living plants with roots and leaves and vascular systems, all of which must be sustained and protected. 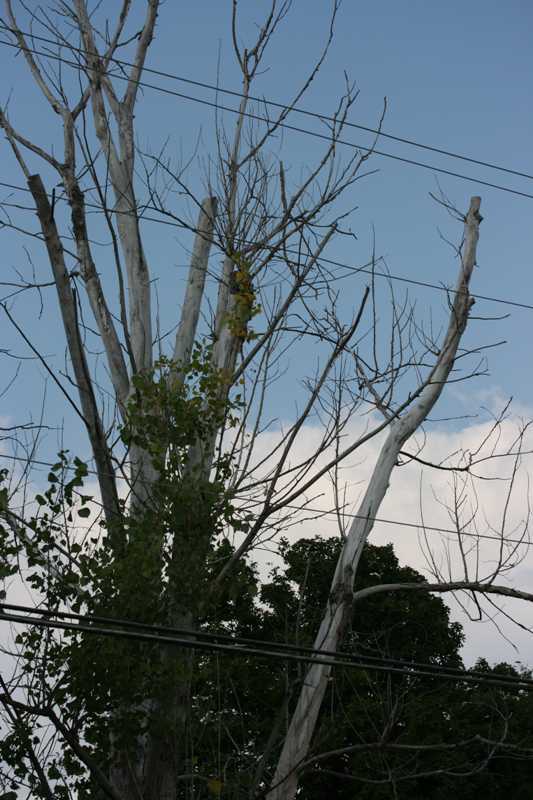 Repeated blows from lawn mowers, weed whips, and car bumpers cannot kill a telephone pole deader than it already is, but it will seriously injure a living tree. The flow of sap that occurs just beneath the bark will be cut off, which can kill slowly or quickly, depending on the extent of the injury. And while parking a car or heavy equipment next to a telephone pole will have no effect on it, doing so near a tree will injure or kill the roots through soil compaction. Without roots, the tree will be unable to take up moisture and nutrients, and without food or water, the part of the tree fed and watered by those particular roots will die. The idea that the roots of a tree are as deep as the tree is tall is wrong. Feeder roots (the roots that take up food and water) are usually in the top 8-12 inches of soil. Even large flare roots do not go straight down. Instead, tree roots stretch outward, surrounding the trunk like an enormous pancake, and reach outward one or more times the height of the tree. So, a car or heavy equipment need not be parked right next to the trunk of a tree to injure its roots. 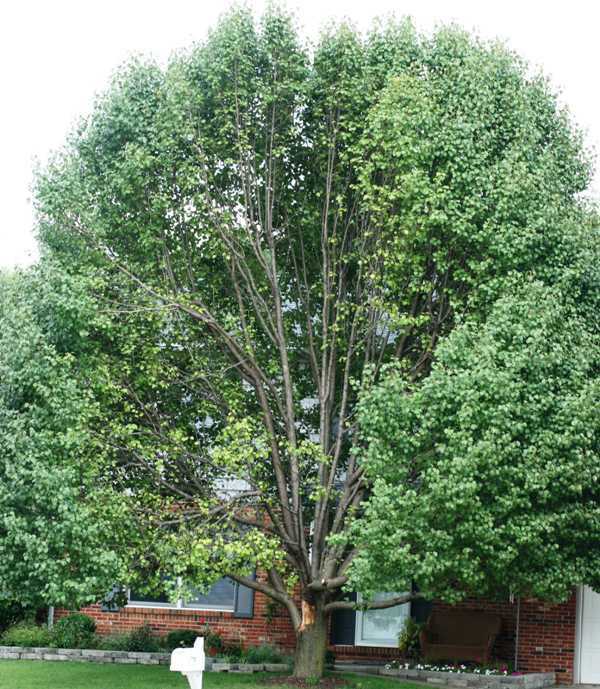 An injury anywhere within the vast root zone can adversely affect a tree’s health. Click here for more information on mechanical damage. Landscape design is not like interior design. A designer should never treat a plant like a piece of furniture, simply placing it where the designer wants it to be without consideration for the plant’s needs. Lilacs require full sun and get powdery mildew in shade and even fail to bloom, while most hostas love the shade and burn up in the sun. For plants to thrive, they must be placed where they want to be. Otherwise, they will decline in health and beauty. For some plants there is no right location anywhere in the St. Louis area, and the same is true everywhere, although the plants to avoid may be different. 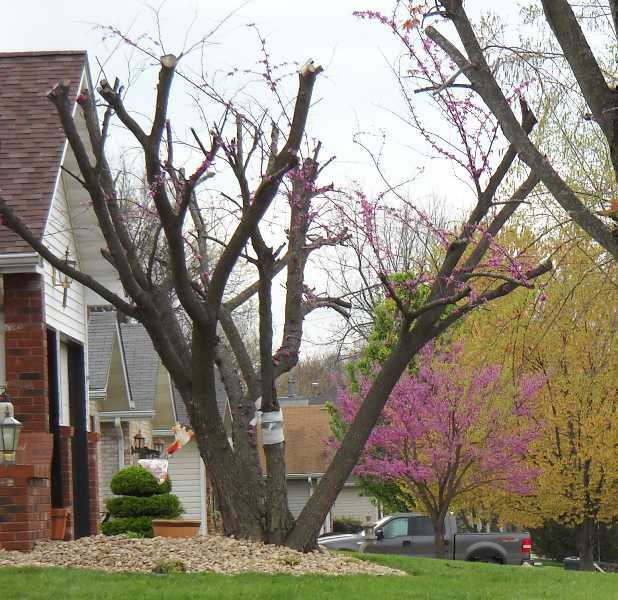 Bradford pears split and break just when they begin to look their best and can cause substantial damage when they fall. And the shrubby honeysuckles (Lonicera spp.) are simply a menace from the moment they sprout. Some plants only look beautiful. For help in selecting the right plant and avoiding the wrong ones, use our PlantFinder search. You can select plant type, height, width, bloom color, bloom time, etc. Click here for the PlantFinder search. For help with problem areas, check the needed "Plants the Tolerate" choice. The perfect example of too much of a good thing. Mulches are great for keeping the soil cool and moist, reducing weeds, and avoiding injuries from weed whips and lawn mowers. Like other organic matter, mulches attract worms and other soil-dwelling invertebrates that help aerate and improve the soil. 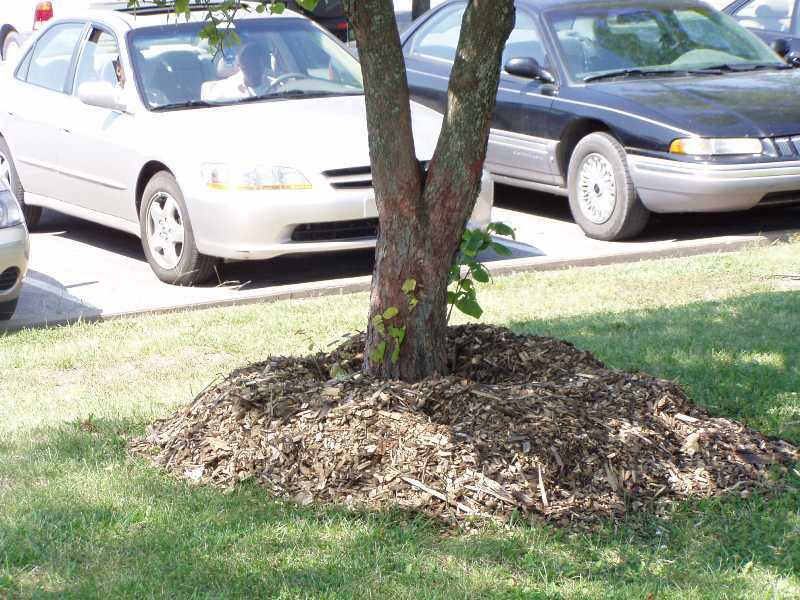 But too much mulch can lead to several deadly conditions: 1) Thick mulches can crust over and actually prevent water from reaching the soil and the roots. Some plants will die outright from this. 2) Others, to compensate will try to grow roots into the mulch, which eventually results in girdling roots, a slow but deadly killer. 3) Creatures, such as voles or meadow mice can hide in thick mulch, keeping their natural enemies (such as, hawks and owls) from seeing them while they girdle trees and gnaw on other prized plants. 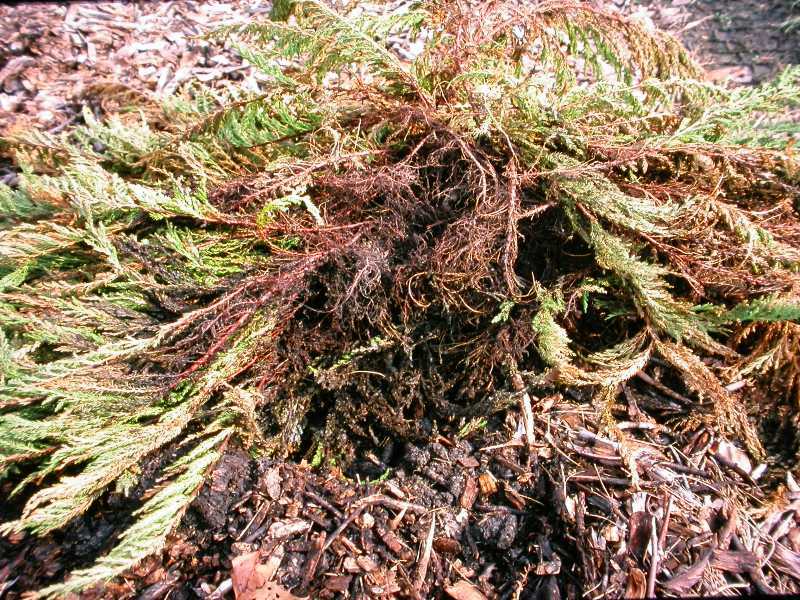 4) If the mulch becomes soggy, it can keep the crown of a plant (the point where it emerges from the soil) too moist for too long, injuring the crown and permitting the entry of bacterial or fungal rot. Crown rots are always serious and usually fatal. Summer mulches should be no more than 2 to 4 inches thick and cover only the root zone of a plant, not the plant itself. The mulch should never touch the crown of the plant, and should never be piled up against the bark of a tree. Winter mulches should not be applied until the ground freezes. The object is not to keep the soil warm, but to keep it evenly cool so that plants do not emerge from dormancy too early in the spring. Again a few inches of mulch over the root zone is usually enough. Few plants require the high mounds of mulch like those used to protect the graft union of a hybrid tea rose. A good rule of thumb for tall mounds of mulch is: when in doubt leave it out or call the Horticulture Answer Service for advice at 314-577-5143 between 9 a.m and noon, Monday through Friday. Why, oh, why do so many fertilize in the spring when there is no turfgrass in the St. Louis area that should be fertilized in spring? None! Zoysia lawns should be fertilized in summer. Bluegrass and fescue lawns should be fertilized in fall. Fertilizing in early spring just feeds the weeds and creates perfect conditions for fungal patch diseases in lawns. 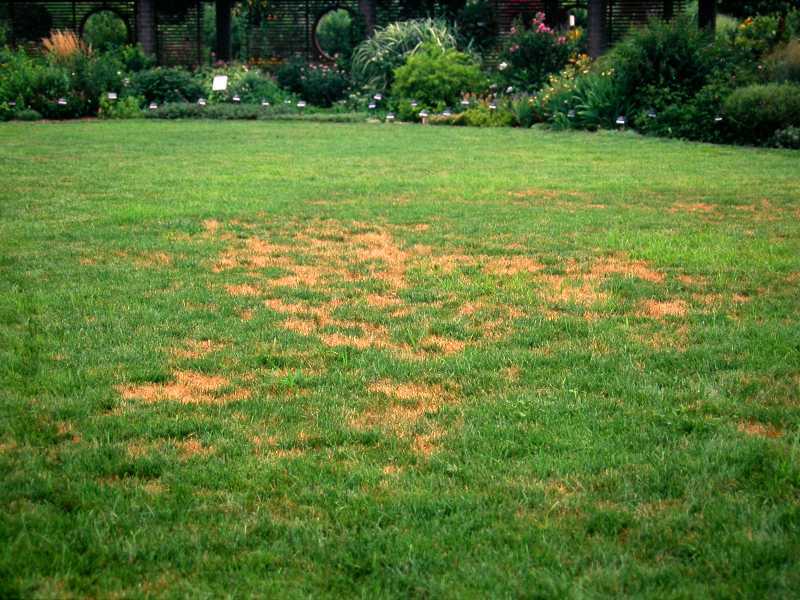 These diseases begin as scattered patches of dead or dying grass that can expand into larger patches, join forces, and become huge bare patches or, more likely, weed patches. The key to preventing these diseases is knowing what kind of grass you have (zoysia, bluegrass, fescue) and caring for it properly. For proper care, check out our Gardening Tips Calendar for what to do each month. Warning! If you use preemergents or crabgrass preventers in early spring, do not buy those that contain fertilizer, and most do contain fertilizer. Also, keep in mind that fungicides can only prevent fungal diseases, not cure them. When selecting plants, pick those that at their mature size are the size you want. This avoids overcrowding and constant pruning. Overcrowding can cause plants to become stunted, because their root system is restricted, or conversely can cause them to grow tall and spindly trying to compete for sunlight with the plants around them. Pruning to size sometimes looks ridiculous and is sometimes impossible. Pines and spruces do not regrow after hard pruning as yews and boxwoods can. And on magnolias, pruning cuts larger than the cuts made by a pair of hand pruners do not heal easily or quickly, leaving the way open for rot to set in. Unfortunately, pruning cannot always fix this boo-boo. Pruning should have a purpose and do no damage. 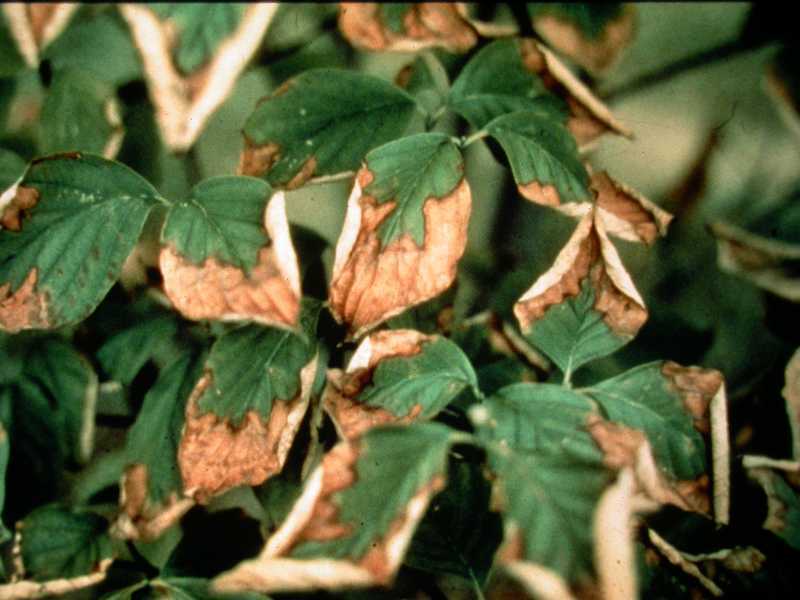 Plants can be injured by pruning in the wrong place and at the wrong time. 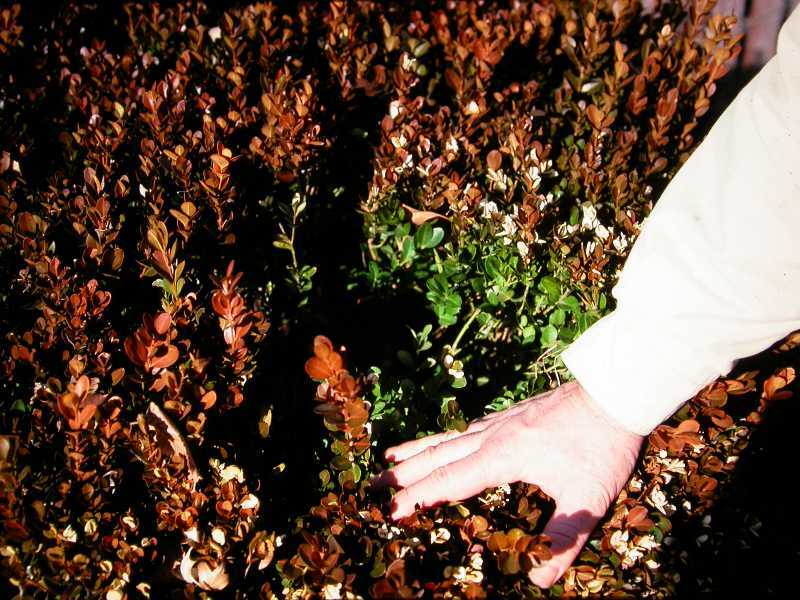 Some plants, such as, boxwoods, will still put out new growth if pruned in late summer, but the new growth may not have time to harden off before winter and will die. Other plants, like magnolias, are intolerant of large pruning cuts and heal slowly. Unfortunately, there are no hard and fast rules for when to prune, except one: Plants that bloom on old growth, which include all spring-flowering shrubs and all bigleaf hydrangeas, should be pruned immediately after flowering. Pruning at any other time will not kill the plant but the plant will not bloom the next flowering season. Call the Horticulture Answer Service between 9 a.m. and noon, Monday through Friday, at 314-577-5143 for correct pruning times for your plants, and/or check out the adult education classes offered by the Kemper Center of Home Gardening at the Missouri Botanical Garden. There is usually a pruning class on the schedule. Topping trees is not pruning; it’s butchery. Moreover, it is more than a boo-boo; it’s a gardening crime. Don’t top trees! No discussion; no exceptions.